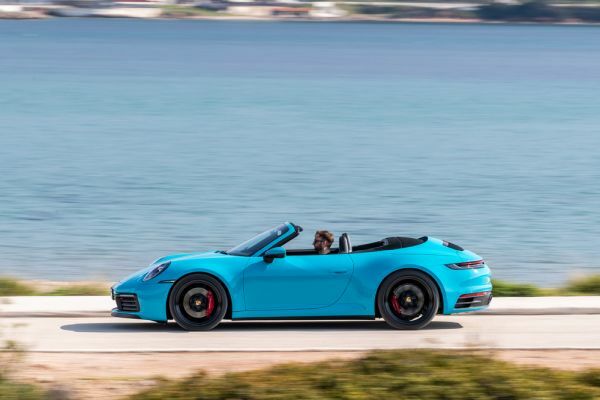 The 911 Cabriolet has a lot to offer: its body features more innovative light-weight components than ever before. The consistently evolved composite design – which now consists of more aluminium, less steel and new composite materials – once again cuts the weight of the bodyshell by around seven percent, without making any compromises in terms of stability, rigidity and safety, which are all at least at the same exemplary level set by the predecessor model. To achieve this, Porsche developers took a different approach by using different plastic materials to create a hybrid design in the A-pillar that guarantees a high degree of occupant protection in the event of the vehicle overturning. This innovative solution replaces the previous tube reinforcements made of super high strength steel. The greatest benefit being that the new reinforcement cuts the overall weight by 2.7 kilograms and also lowers the centre of gravity. Both effects have a direct impact on the outstanding handling dynamics of the sports car. The composite component consists of three elements: a so-called Organo sheet, additional die-cast ribs and a structural foam. Organo sheets are pre-fabricated, highly sturdy semi-finished products made of fibre-glass reinforced plastic. These sheets are cut and reformed as part of a multi-stage process for use in the 911 Cabriolet. In the same process step, the component is equipped with a ribbed pad made of die-cast plastic. In the last process step, an additional layer of structural foam is added to the hybrid component. This layer expands when exposed to heat during the painting process to thus secure the reinforcement within the A-pillar cross-section. The A-pillar itself consists of super high strength sheet metal components such as boron steel. An increase in the amount of aluminium used lies at the core of the evolved, light-weight design of the new 911 generation – in both the Coupé and the Cabriolet. Apart from the front and rear aprons, the outer skin is now made entirely from this light alloy. The new door design – made exclusively from aluminium sheet – reduces the weight of the bodyshell without negatively impacting stability and quality. The high degree of toolmaking competence at Porsche is also evident in the side wall of the Coupé, which is now made of aluminium to cut the overall weight by approximately twelve kilograms. This posed the challenge of developing the right tools and processes for the job as, compared with steel sheet, there is a significantly higher risk of tearing when drawing light alloys. A draw depth of around 30 centimetres is achieved during production of the 911 Coupé’s side wall. In addition to high-strength steels, more extruded aluminium profiles were also used in the bodyshell, such as for the front and rear longitudinal members, inner and outer door sills and floor reinforcements. Their share has been increased from three to 25 percent. Porsche also uses more die-cast aluminium parts in the new 911, for instance as part of the front spring strut mount, rear tunnel housing, rear longitudinal members and impact absorber mounts. The benefit of die-casting is that even complex, geometrical components can be produced as one single component. Reinforcements or screw connections no longer have to be produced and welded individually. As a result, the component not only becomes lighter, but production steps also become obsolete, making production more efficient. Up to now, one disadvantage of aluminium die-cast parts had been the necessary thermal treatment following die-casting. This step is required to lend components the desired material properties that are crucial for crash performance, for example. Thermal treatment therefore represented a separate and thus energy and time-consuming step in the production process. In the new 911, Porsche now utilises the temperatures generated during painting processes to perform final treatment of die-cast parts. Materials and production processes define the ideal connection technology: welding, bonding, clinching, screw connections – no less than ten methods are involved in assembling the body of a new 911. One new feature, for example, is friction welding with countersunk head bolts to link components made of aluminium and steel. In this process, the steel bolt is pressed through the aluminium at such a high speed that friction causes the countersunk head bolts to merge with the steel component, creating a particularly strong connection. The body of the new 911 consists of a multi-material mix and is thus taking the next big step in intelligent light-weight design, advancing the weight reduction strategy started by the predecessor model. At the same time, the evolved body concept also guarantees higher rigidity. Compared with the predecessor model, the 911 Coupé delivers better torsion and bending values. As a result, the 911 stays unwaveringly on course even when driven with a sporty driving style on sections of road with different surfaces. Groupe PSA continues its autonomous driving tests as part of the European L3Pilot project. The BMW Group and Microsoft launch the Open Manufacturing Platform. SEAT dazzles at the Mobile World Congress Barcelona: what’s next? VW - Only a united Europe can master structural change and safeguard social accord ..
Porsche invests in US start-up "Urgent.ly"